You know all those home movies and slides in your basement? Have them converted to DVD! Keep the memories intact, give them to Dad on Father's Day, or get ready for that family reunion. 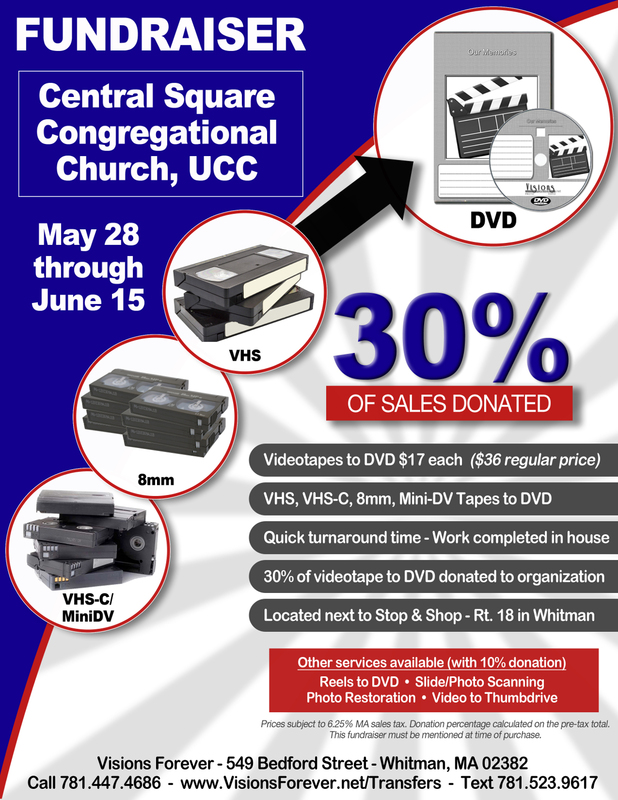 And do it 5/28-6/15, and you'll help Central Square Congregational Church, UCC keep their facility available for the twelve-step support groups, the scouts, the Bridgewater Food Pantry, the BSU Alumni Chorus, and so many more groups that call CSCC home. At no additional cost to you! Just mention you saw this fundraising flyer when you visit Visions Forever at 549 Bedford St Ste 2, in Whitman. Visit www.csccucc.org/events for full church information, and www.visionsforever.net for info on their services.